The voice-activated 5-inch Garmin nuvi 2460LT super-widescreen sat nav is so easy to use, you just talk to it. It's hands-free calling compatible and includes premium lifetime traffic avoidance. Packed with high-end navigation features and preloaded street maps for full Europe, both Eastern and Western Europe, a multi-point route planner automatically sorts multiple destinations into an efficient route. Includes Lane Assist with PhotoReal Junction View, myTrends predictive routing, spoken street names and pedestrian navigation options. Garmin nuvi 2460LT has been discontinued. Accessories, spares and parts are still available for your nuvi 2460LT, as are road maps. It's easy to see where you're going on Garmin nuvi 2460LT’s 5-inch (12.7 cm) touchscreen display. View map detail, driving directions, photos and more in bright, brilliant colour. With its big, bold display, you won't miss a thing.It’s hands-free calling compatible and includes premium lifetime traffic avoidance. Packed with high-end navigation features and preloaded street maps for full Europe, a multi-point route planner automatically sorts multiple destinations into an efficient route. Includes Lane Assist with PhotoReal Junction View, myTrends predictive routing, spoken street names and pedestrian navigation options. Garmin nuMaps Guarantee - simply register your new Garmin nuvi 2460LT within 90 days of first using your sat-nav to see if a free map update is available. See map coverage below for more details. Garmin nuvi 2460LT not only tells you where to turn but listens to your spoken commands. With its innovative speech recognition, you can control nüvi with your voice - allowing you to keep both hands on the wheel. Simply wake up nüvi with a customisable voice command and begin speaking menu options are clearly displayed on the screen. Tell nüvi "Find Address" and speak the address to start navigating. Garmin nuvi 2460LT includes nüRoute technology with trafficTrends and myTrends predictive routing. With myTrends advanced routing capabilities, nüvi learns your driving habits and recognises your favourite destinations to predict where you’re going. This saves time manually activating a route on repeat journeys and refines your route-planning based on previous trips. With trafficTrends, Garmin nuvi 2460LT automatically learns traffic flow trends to improve your routes and better predict your estimated time of arrival based on time of day and day of week. So whether you’re driving to and from work or to a regular weekly event, your Garmin nuvi 2460LT sat nav will help you get there on time. Garmin nuvi 2460LT PhotoReal™ junction view provides a realistic reproduction of road signs and junctions along your route, with stunning landscape detail for exceptional clarity down to the exact trees and pylons! With Lane Assist, there’s no more guessing which lane you need to be in at upcoming exits and junctions, with arrows that indicate the proper lane for navigation. So there’s no need to panic, hesitate or make last-minute lane changes, even on unfamiliar routes. Steer clear of traffic with Garmin nuvi 2460LT’s integrated FM traffic receiver and included premium lifetime traffic updates and travel confident in the knowledge Garmin will handle any traffic problems on your route ahead. Subscription-free for the lifetime of the sat nav, you will receive alerts about traffic delays and roadwork's on your route. Next, simply touch the screen on the sat nav to view traffic details or detour around the problem area. Keep your eyes on the road and both hands on the wheel with Garmin nuvi 2460LT integrated Bluetooth® wireless technology, microphone and speaker. Just pair with your compatible mobile phone and talk hands-free through the sat nav. Simply dial numbers using nüvi’s touchscreen keypad and answer calls in a tap of the screen. Enjoy convenient one-touch dialling for your phone book contacts and the sat nav’s points of interest listings and keep in touch while driving safely and legally. Garmin nuvi 2460LT saves you fuel and money with ecoRoute - Garmin’s innovative green feature that calculates the most fuel-efficient route, tracks fuel usage and more. You can choose to take the “less fuel” option as a routing preference and when selected, nüvi will determine if a more fuel efficient route exists based upon road speed data and vehicle acceleration data. ecoRoute helps you develop more efficient driving habits, calculates trip cost and enables accurate expense reporting too. Garmin’s unique Cyclops speed cameras are built in, giving real-time, reliable and accurate alerts, overspeed warning and speed limit information as you approach one of hundreds of fixed, mobile, variable limit and temporary safety cameras. New or moved cameras are constantly tracked and the central database is updated by Cyclops daily. Garmin nuvi 2460LT also contains speed limits for all major routes plus Garmin’s new speed limit reporting, which enables you to manually correct / update speed limit information and share any changes via USB. ‣Where Am I? feature - find the closest hospitals, police stations, petrol stations, etc. The Garmin nuvi 2460LT has been designed to be plug and play, and as such can be transferred from vehicle to vehicle with ease. The Garmin nuvi 2460LT is powered with the 12-volt vehicle power adaptor and attaches to your vehicles windscreen via the Garmin nuvi 2460LT suction cup bracket. Alternatively with the dashboard disk you can mount the suction cup bracket on your dashboard instead, all three accessories are supplied with the Garmin nuvi 2460LT. The Garmin nuvi 2460LT is preloaded with City Navigator® NT for full Europe, both Eastern and Western Europe provided by NAVTEQ. NAVTEQ maps provide high quality detailed street level maps, which in addition to street information include features such as route calculation, Points of Interest (POI), Estimated Time of Arrival, and more. Looking for accessories and spares for the Garmin nuvi 2460LT? All parts are genuine Garmin product and specifically designed for use with the nuvi 2460LT. Accessories available to purchase include a 5-inch carry case, GTM 36 traffic and vehicle power charger, a weighted dashboard mount and micro USB cable. 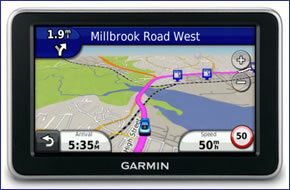 Looking for sat nav maps for the Garmin nuvi 2460LT? All mapping comes on microSD card with SD card adaptor and is genuine Garmin product and specifically designed for use with the nuvi 2460LT Countries available to buy include: UK and Ireland, France and Benelux, Full Europe, North America, Australia and New Zealand.